To own a classic car is to own a car with a history, in modern times people are quick to upgrade to the new model, whether it be a phone, laptop or a car. I feel that you lose personal attachment to your items when you are so quick to trade them in for the next model, a car should be more than an item, it represents all the collected memories that you’ve shared with your car. So much in our lives are subject to change, think about all the relationships, jobs, houses, cities you’ve seen, food you’ve eaten… the list goes on. How nice is it to think that you’ve had something that has remained a constant throughout, something that has shared so much of your life that it a part of your family. This is what a classic car offers you, when you sit in your classic car it doesn’t matter how much everything has changed it doesn’t matter where you’re going or where your coming from, when your sat in your classic car you are everything that you have ever been. It’s not only about your experience in your car, when you’re sitting in a classic car you’re sat in a piece of history, a car that has seen it all and remained golden throughout. Doesn’t your classic car deserve to have a new lease on life, keep the memories but drive your car without the worry that time has taken its toll on your beloved car? When you upgrade to electronic ignition you give air into old lungs, your car will purr just like it did when it first came into production all those years ago, this is now a car that you can pass down to your children and let them share a part of their life with a vehicle. Britain used to be great, in the 1950’s we where the second largest manufacture of cars and the largest exporter in the world, the money generated from Britain’s car industry has shaped the world and with it some truly classic cars have been created since; Aston Martin, Jaguar E-Type, Land Rover Defender, Lotus Esprit, McLaren F1, MGB, original two-door Mini and the list goes on. The Jaguar E-Type is the pinnacle of good looks and class, and yet the Jaguar E-Type was the working class sports car, when first produced in a little Coventry shed in 1961 the E-Type was a third of the price of its competing Ferrari and yet despite of its modest £2000 price tag the E-Type with its 3.8ltr straight 6 engine was faster having a top speed of 149.1 mph and travelling from 0 to 60 mph in 7.1 seconds the E-Type was a 1961 monster. On its release Enzo Ferrari called it “The most beautiful car ever made” and in 2008, the Jaguar E-Type ranked first in a The Daily Telegraph online list of the world’s “100 most beautiful cars” of all time, So how could you not fall in love with this car. 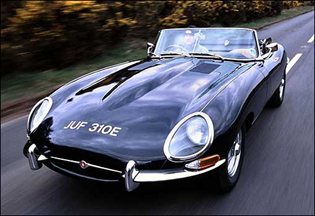 With a celebrity list such as George Best, Brigitte Bardot, Tony Curtis and Steve McQueen the E-Type became the definition of a classic British sports car and has remained that was ever since. 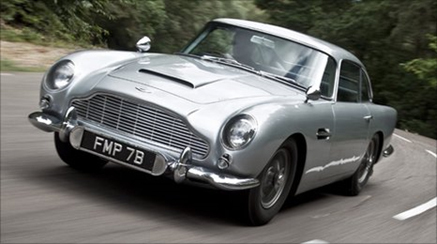 How can we forget about the famous Db5 used in so many iconic bond scenes? First produced in 1963 Aston Martin’s Db5 is most famous for being used in the bond film Goldfinger in 1964. The public loved James Bond in the DB5 so much that the model has been used in Tomorrow Never Dies (1997), The World Is Not Enough (1999), Casino Royale (2006) and most recently Skyfall. The DB5 has been seen on the cinema screen with various gadgets and gismos like the ejector seat or the tire slashers, the car became such an icon for the Bond movies that it is credited as bond’s greatest car.